Although you might still recall feelings of dread when you were told that you had to work together with a group of peers on a project for a class assignment, they are the projects you remember the most. In the fourth grade I worked with a group of my classmates on a book report and although I dreaded the task before, I had a lot of fun completing the assignment and I still remember exactly what it was about. This leads me to believe in the idea of project based learning for students. It is always great when you can find things that help make your job easier and more interesting. It is especially nice when those things are free. With schools tightening budgets we thought it might be fun to let you know about 10 totally free tools that are available to you on the web. These tools will help you connect you with students, parents, and other teachers. Stay organized and access additional resources to supplement your curriculum. Create an interactive classroom to engage students in learning with these exciting and free tools. North Carolina is on it’s way to becoming the first state to offer Microsoft certification and training in every one of its high schools. It is expected by next fall that all of North Carolina’s high schools will be participating in the program representing the largest adoption of the Microsoft IT Academy program to date. Students will have the option to get certified as a Microsoft Office Specialist or a Microsoft Certified Professional by successfully completing training and passing certification exams. To support instructors and students, the program includes access to online learning, course materials, instructor resources, and support materials. The hope is that this program will give students an advantage in a competitive job market. These certifications are widely recognized and the skills learned are highly sought after. The certifications represent students understanding of current industry standards and gives them the edge in the job market. Do you see this catching on? Is certification through online learning materials the way schools are headed, or are too many still resistant to non-traditional learning methods? Advancements are being made in technology every day, and slowly these advancements are now being implemented into the classroom, and are trickling down into K-12 classrooms. As good as this sounds, the key word here is “slowly” – there are some things that need to be considered when thinking about implementing new tools. Digital textbooks are working their way into schools everywhere, allowing easy, portable access to that stack of books that you would normally have to carry around – but one of the major roadblocks to the adoption of digital textbooks in schools so far has been financial. Schools do not have the funding to adopt the technology needed to support digital textbooks while still providing traditional textbooks. Schools also for the most part do not have the internet speed and connectivity required to support digital textbooks. Another issue is finding teachers that are willing to adopt these new digital textbooks, and then the amount of professional development required to get teachers up to speed on these new technologies and materials. Also, what platform and format will these textbooks be offered on? How will you implement supplemental teaching materials that are required to support these new textbooks? In the end this adoption is probably inevitable. The way to make it happen is a collaboration of teachers, IT departments, administrators, and curriculum experts. If you create a consistent, useful, and easily accessible platform, the hassle of implementation should be greatly reduced. In 2018 it is projected that 63% of all job openings will require post-secondary education or training. The problem with this statistic is that although higher education is readily available, by age 30 less than 50% of Americans have earned a college degree. The new initiative from the Bill & Melinda Gates Foundation aims to improve student outcomes through the use of technology. The Foundation is going to award $35 million in grant money to institutions or organizations that utilize technology to increase enrollment and completion rates in higher-education. What do you think? Is it the rising costs of higher-education hindering completion? The time that has to be invested in it? A combination of both? Or perhaps the use of outdated methods is less desirable to today’s potential employees? Let us know in the comments! Yes, you read the headline correctly – Adobe CS5 training is available for you and your students, with more coming soon! This release has been a bit different for us compared to the CS4 release for many reasons. First, we decided to produce each ACA course with both a Mac and Windows version. 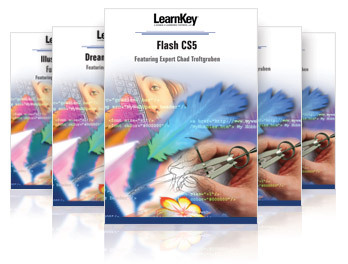 For example, you can purchase Photoshop, Flash, and/or Dreamweaver presented on a Mac or Windows environment. Our goal is to accommodate individual schools based on their needs; some schools use Macs and others use Windows-based PCs. The essential content is the same, we meet all the objectives to prepare for the ACA exams in both versions. Not long after receiving two Eddie Awards for our training courses, LearnKey’s role in helping 26 students from University Senior High School achieve their Microsoft Office Specialist credential was featured in an article on eSchool News. Head on over to the eSchool News website to read the full article about how our Microsoft Office interactive learning library helped set these students apart from their peers on resumes and college applications. The first initiative for the George W. Bush Institute was announced recently by former First Lady Laura Bush. The initiative will be geared toward improved performance of school principals. Why did they choose this as their focus when there are so many education issues that need to be addressed? Simply put school principals have a lot of influence on the school environment and teacher success, which in turn influences the students. The initiative will aim to provide 50,000 principals and future principals with leadership training over the next ten years. Generally principals come from an educational background and not from a leadership background. This training is aimed at providing them with the leadership skills needed to run a school. The institute will be working with the help of other organizations to provide the training to principals and future principals. What do you think about the first initiative? Do you think this top down approach will be successful? If you don’t where do you think they should have invested the resources first? Did they start high enough with principals or should they have considered starting at a district level? State level? National level? One of our Sales Representatives recently returned from the New Mexico Technology in Education (NM TIE) conference and one of the biggest things he noticed was the attendees were predominately from Higher Education, mostly community colleges and they all had one thing on their minds – distance education. One reason distance education continues to be a growing trend in higher education is because it is convenient and you can fit it into your schedule. This has become increasingly important as costs of higher education continue to rise in a down economy, most students are working and going to school. Distance education allows students the opportunity to do both.